GV-Edge Recording Manger is a tool designed for recording management of remote GV-IP Cameras and GV-Target Cameras. It is an integrated interface from which you can assess live view, assign recording to NAS servers, enable recording, play back videos and view storage space without visiting each host´s Web interface. Any connection with hosts can be disabled without affecting or stopping the hosts´ normal functioning. GV-Edge Recording Manager also supports live view display and video playback of hosts connected to GV-Video Server, GV-VMS, GV-System ,GV-Recording Server and GV-SNVR. Through GV-Edge Recording Manager, you can have GV-IP Cameras or GV-Target Cameras record to NAS servers and also view the storage information such as the occupied space and remaining space. GV-NAS Systems are also available at your choice. Note: It is recommended that you use the internal GV-USB Dongle to have the Hardware Watchdog function which restarts the PC when Windows crashes or freezes. 1. 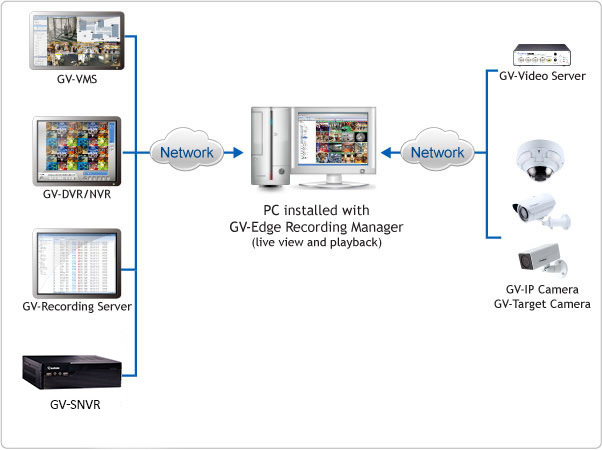 Recording to GV-NAS Systems is only supported by GV-IP Camera and GV-Target Camera of the specified versions. 2. Files recorded to GV-NAS Systems are stored in the MPEG4 format and those recorded to memory cards are stored in the AVI format. Note: NAS setup is supported by GV-IP Camera (firmware V3.0 or later) and GV-Target Camera (firmware V1.02 or later). Note: The Playback Mode is not available when you access the recordings saved on the NAS System. GV-NAS Systems GV-NAS System is a Linux-based, network attached storage device designed to store GV-IP Camera and GV-Target Camera recordings.